The Cloud phenomenon is quickly growing towards becoming the de facto standard of Internet computing, storage and hosting both in industry and academia. The large scalability possibilities offered by Cloud platforms can be harnessed not only for services and applications hosting but also as a raw on-demand computing resource. A first step towards accessing on-demand resources is using the Cloud’s API to get access to resources. Amazon EC2 has become a de-facto of Cloud platforms. Third parties have considered Amazon EC2’s API as the standard definition of a Cloud API. As a result, other IaaS providers have have also implemented the EC2 API and expose the same interface. Eucalyptus is one example of an open source IaaS platform that does this. The purpose of the current demo is to present the DIET Cloud extension that can be used to interact with an IaaS Cloud platform through the EC2 API. We have used a local installation of Eucalyptus as an Amazon EC2 alternative. As an extension to the DIET platform we have added a new type of service daemon: SeD Cloud. It have access to the a library providing the Amazon EC2 interface. By using the SeD Cloud, the DIET user can access to virtual resources from an IaaS Cloud that implements the Amazon EC2 interface. 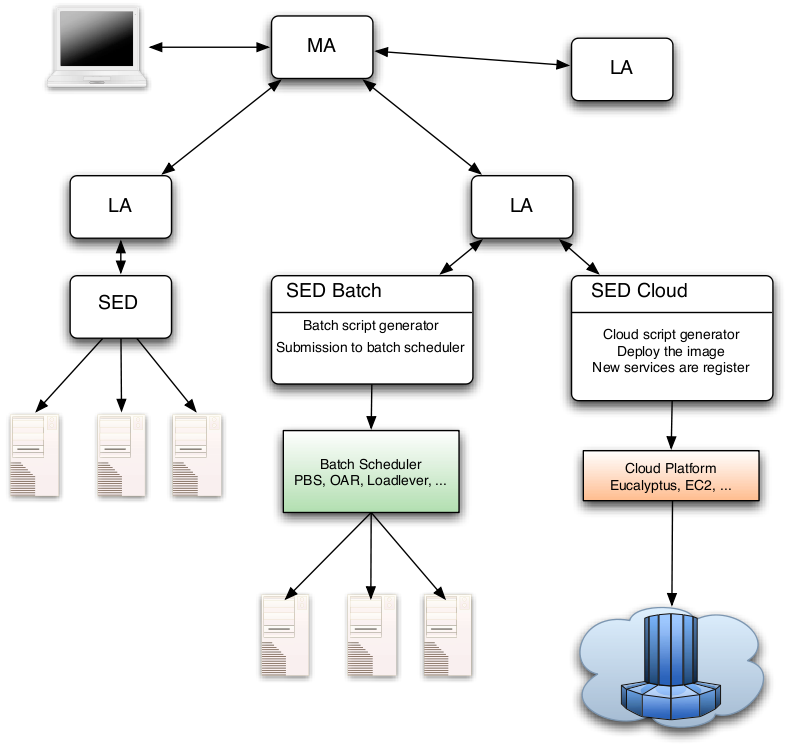 When developing the SeD Cloud we have used Eucalyptus as an Amazon EC2 alternative. We have also experimented with EC2 itself and have obtained positive results.